Kevin Grigsby, East TN. 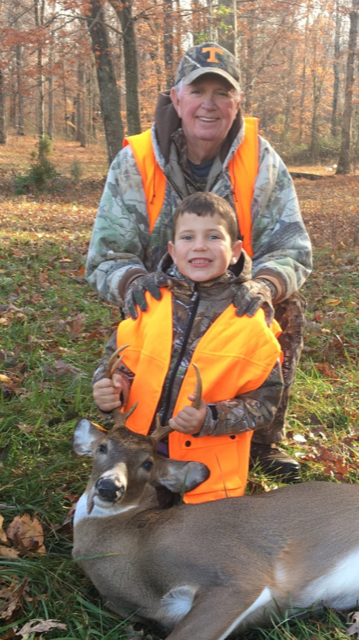 – There is now a 3rd generation deer hunter in my family. My father James, me and now my six-year-old son Hayden. 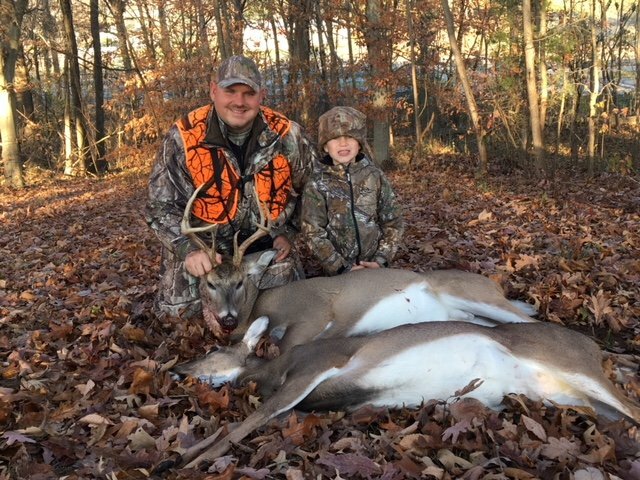 2017 was his 1st season youth hunting. He is crazy about sports and the outdoors. If he wasn’t at football or basketball, me or my father had him with us in the woods in archery or youth season but had no luck. Hayden was out of school the day before Thanksgiving so he went with my Dad to hunt a blind over a food plot. I sat in a stand 400 yards away to spot for them. I saw 8 does but where I was they could not see them. The next day was Thanksgiving with perfect weather but Hayden wanted to sleep in. I went by myself and hunted a box blind a small buck passed by at 30 yards at first light. I was really wishing my son was there. Later in the morning, I spotted a nice 8 point trailing a doe across the field with our night vision monocular or night vision scope. At 200 yards I took a shot and dropped him in his tracks. The doe stood around wondering what was happening so I decided she needed to ride in the back of my truck also. I got home and told Hayden he should have gone and told him about the other buck. He was excited and put his best hunting camo on for pics with my deer. 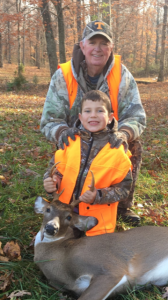 Two days later on Saturday, I had to go back to work but Dad and Hayden wanted to hunt. I sent them to the box blind I had hunted thanksgiving. As the morning went on I called them several times they were seeing deer but all too far away. I told them to stay till at least 11:00. Good thing Hayden had his tablet and snacks to keep him occupied because around 10:45 the same buck I saw Thursday stepped out 300 yards away. Hayden used a Primos can call to bring him to 40 yards and one shot from his Ruger Ranch .300 Blackout and he got for his birthday put the 6 pointer down. The phone call I got from them was pure excitement. They rode around town showing off Hayden’s deer and he was the happiest hunter I know of that day. My son is very excited for any outdoor sport it doesn’t matter Deer, Ducks, Fishing it doesn’t matter he wants to tag along and I would not want it any other way. He does brag that his 1st deer was twice as big as mine since mine was a 3 pointer.